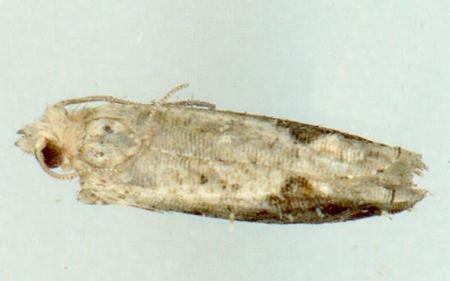 The adult moth has pale grey forewings, each with an irregular dark brown area around the wingtip. The hindwings are pale brown with dark veins. Each hindwing has a cusp along the hind margin. The wingspan is about 1.2 cms. CSIRO Publishing, 2006, pp. 393-394. Volume 32 (1908), p. 323.